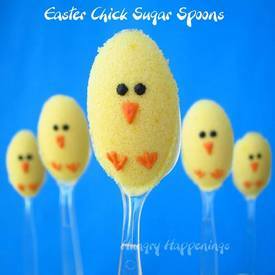 Instead of sugar cubes, serve these cute Easter Chick Sugar Spoons. They'll melt your heart before melting in your coffee or tea. The snow has almost all melted in our yard and it's hard to believe Easter is Sunday. We may be hunting for eggs in winter coats. I figured everyone would be enjoying hot beverages at our Easter gathering, so I created these sweet little sugar coated spoons to serve alongside the tea and coffee.